My family didn't have much money when I was growing up. For years my father worked three jobs and my mother worked two just to keep us financially afloat. As the Irish in my family would say, to "keep us off the dole." My parents had too much pride to go on public assistance, even though we qualified. When times finally became good enough for us to be considered middle-class, we were able to afford some luxuries we couldn't before. One of those was Fruity Pebbles. 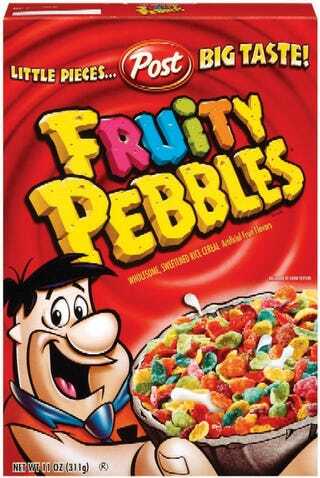 Regardless of your feelings towards Fruity Pebbles, they represent one aspect of my childhood. I loved the look of them, the smell of them, the sound of them, and of course the taste. Everything about Fruity Pebbles was intoxicating to me. I was a fan of The Flintstones, so it was natural that I'd gravitate towards this cereal. I chose Fruity Pebbles over Cocoa Pebbles because I wasn't (and still am not) a huge fan of chocolate. I'm a voracious reader, and as I ate them, I would read every inch of the Fruity Pebbles box, ingredients included. I would do the puzzles on the back of the box, the word jumbles, the word searches, the mazes... anything to keep my interest as I shoveled spoonful after overloaded spoonful into my gaping maw. One day something was different - a contest was being advertised on the box! I don't recall the exact parameters of the contest, nor do I recall any of the rules. I do know, however, that I did everything I was supposed to do to win the grand prize - a huge steamer trunk FULL OF TOYS! I was ecstatic when I completed all the requirements and sent my information in to those wonderful people at Post. Remember, as a child my family didn't have much, so a trunk full of toys was like hitting the lottery numbers for me. I was so proud of my accomplishment that I told everyone I knew that I would be getting the grand prize! I recall the fine print saying "six weeks for delivery." So I ran home every single day to see if there was a monstrous package awaiting my arrival. Day after day, no package. Week after week, no package. Month after month, no package. I never received my package. I'm sure there was some fine print that my sugar-addled ADHD brain overlooked in my frenzy to claim my rightful prize. Probably something along the lines of "one winner will be chosen from all entrants," instead of "there will only be one winner, little Freeman, and it shall be you!" Now for most people, that could leave a lasting scar. While I've never forgotten how Fruity Pebbles slighted me, how I'd brought them to the dance only to see them leave with someone else, I could never stay angry at them. If there's anything you can take from my story, take this - Fruity Pebbles is a magical cereal. Your heart will fill with joy if you eat them. Please, this week when you're shopping for Thanksgiving, drop by the cereal aisle and buy yourself a box. And if your first spoonful has quiet hints of childhood sadness mixed with love, I hope you'll think of me.